In this article, I’m going to crunch some numbers and show you exactly how much money a Bangalore coworking hub can save for you in rent and costs. Selecting a prime location for business in Bangalore is one of the most important things you have to do when starting a new business, but you don’t necessarily have to make a huge investment for this. Looking for a prime location for business? Contact us now. Take a tour of your nearest Evoma Business Centre in Bangalore. But buying commercial property and renovating and furnishing it to meet your business needs requires a huge upfront investment. Rentals for Bangalore office space in top locations may also be out of your price range, if you are a new small business or early-stage bootstrapped startup without funding. If these two options are not on the table, then does it mean that you have to set up shop in a lonely place far from your customers and the main business hubs in Bangalore? There is actually another option that is increasingly popular in Bangalore – plug and play workspace for startups, SMEs, temp project offices of large companies, and even freelancers. But before we get to the coworking part, let’s look at the fixed and variable costs of doing business in Bangalore, so that we can do a proper comparison. Fixed costs are the costs that remain the same, irrespective of the amount of business activity and transactions that happens. Some examples of fixed costs are office rent, insurance premiums, loan repayments, etc. Variable costs are the costs that change as per the output of the business. Some examples are the electricity bill, advertising and marketing costs, raw material used and other production costs, etc. Now that you have a clear idea of the fixed and variable costs associated with doing business, we can move to the important bit about how coworking space reduces office rent and costs. Here’s a comparison chart that shows you the clear difference between coworking space vs monthly office space rental and other fixed costs. 1. Office Rent: With monthly rented offices, you have to pay the fixed amount of rent, irrespective of whether and for many days or hours you are actually using it. But in coworking space, you pay for use by the hour or day. So even if you are using the space on a Rs. 300 day pass for 5 days/week, you’ll only be paying Rs. 6,000 for the month. If you only use for 15 days, then the cost comes down to Rs. 4,500. If you use only a desk for a few hours a day at Rs.75 per hour, the cost drops even more sharply. You only pay for meeting rooms, conference rooms and other facilities as and when needed. Bear in mind that this is the same Bangalore office space location and facilities for which you would pay Rs.20,000 or 25,000 in monthly rental in Whitefield, Marathahalli, HSR Layout and other business hubs. 2. WiFi – Jio may have made data and calls cheaper, but this is still a vital part of your monthly fixed costs. You need a high-speed broadband Internet connection for business. You need to pay the subscription and data usage charges for it, as well as a backup data card or WiFi dongle that you keep in case the main connection is down. Then you pay for WiFi on your mobile, which is something you need while you’re on the move. All told, it adds up to a hefty bill every month of around Rs. 1,000. But in coworking space, a reliable WiFi connection comes free of cost when you pay for a day pass or a desk or use of any other facility. 3. Property Loss and Insurance Premiums – Insurance helps cover the cost of material and property loss. But you still have to pay insurance premiums, and the claim might still not cover all the losses you suffer. There’s no such costs when you make use of a coworking space, since the premiums and other costs of property maintenance and upkeep are borne by the management. 4. Office Setup and Maintenance Costs – Even if you rent an office instead of buying it, you still need to furnish it and install all the fixtures. You need to buy computers and software, you need to hire people to manage, maintain and clean the office and the computers and everything else. This is a significant amount in setup and monthly costs,. But in coworking space, you walk in, use whatever you pay for, and then you walk out. There is no purchase cost, no maintenance cost, and no cleaning costs. Now it’s time to discuss the advantages that coworking space offers you in comparison to the variable costs of running a business. Electricity and Water Bills – When you take up an office space for rent in Bangalore, you’ll be paying a significant amount every month to BWSSB and BBMP for water and electricity bill payments. But you don’t have any such expenses if you are using a coworking space as your office. Project Costs – You may at present be hiring people and putting them on your payroll, or getting things done by an expensive outside agency for every project you take on. But if you are coworking at Evoma, you can find app developers, web designers, digital marketers and other freelancers working at desks near you. Just collaborate with them as and when needed for a project. Depreciation Costs – We already looked at the fixed costs of setting up your office, furnishing it and maintaining it. The variable factor there is that the things you buy depreciate in value depending on usage. In a coworking space, you don’t have to worry about depreciation because it’s on us. Note that we also spend heavily every year on upgrades and new furnishings to make sure the place looks new and everything is working properly. You don’t have to worry about the cost of buying new computers or upgrading Windows or MS-Office or replacing the air-conditioner filters, broken tables and chairs, etc. 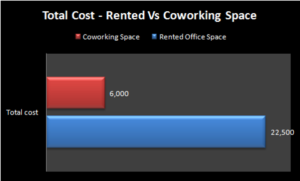 To conclude, it’s clear that making use of Bangalore coworking space reduces the rent and costs as compared to renting a physical space. You can always move to a full-time office space once your business scales up to a point where you have enough employees, customers and work. That provides you with more freedom to personalise and add some branding to the space. But coworking is the best option for early-stage startups, SMEs and corporate branch offices that are struggling to get their work done while balancing visibility, sales and office space requirements within limited funds. Want to get a firsthand look at coworking? Try it free for a day – only at the Borewell Road Evoma Coworking Space in Bangalore.